A Port Macquarie woman, who told police she’d drunk two bottles of wine before attempting to drive home from Sydney, has been charged with high range drink driving. Officers arrested the 58-year-old at a service station on the M1 Motorway near Wyong, after she was found next to her crashed car around 9 o’clock on Monday night. Pictures show the vehicle balanced on a small ledge, with all wheels off the ground. 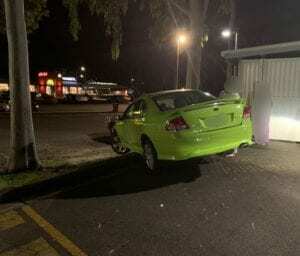 The woman was taken to Wyong police station where she returned a blood alcohol reading of 0.170. Her licence was suspended and she’s due to appear before Wyong Local Court in April.